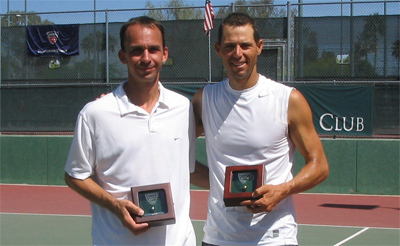 Scottsdale Resort & Athletic Club – Scottsdale, Ariz.
Southwest adult players from Central Arizona brought home a nice collection of hardware from the Men’s 35 Hard Court Championships in mid-April. While Section players were all over finals and semifinal rounds, none could quite get over the hump and bring home the coveted gold ball national age group trophies in either the singles or doubles finals. In singles, top-seeded Stuart Duncan of Laguna Beach, Calif. (above right in picture), steamrolled all opposition, not dropping a set in any of his four matches on his way to the 35s title. In the final, Duncan squared off against Scottsdale native and third seed Jesse Ponwith (above left) who was playing in his first singles gold ball final. Duncan controlled the match from the outset, breaking early in the first and second sets with his heavy groundstrokes and serve on his way to a 6-3, 6-1 scoreline. Central Arizona players Dan Marting and Jeff Sikes, both of Phoenix, also reached the semifinals in singles. 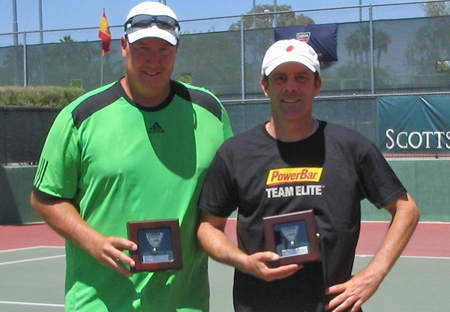 In doubles, California natives Neel Grover (Laguna Niguel, Calif.) and Arthur Hernandez (Huntington Beach, Calif.) snatched the doubles title, downing Gary Donnelly (Scottsdale) and Andy Stoner (Cave Creek, Ariz.) - both pictured right - by a 6-3, 6-1 count. Marting and Ponwith also placed third in the doubles, picking up the bronze ball with a 6-4, 6-3 victory over Phoenix’s David Critchley and Daniel Kilen. Players from Florida, Nevada, New Jersey, Washington, and Texas took part in the five-day tournament, held at the Scottsdale Resort & Athletic Club from April 17-21. The USTA National Men’s 35 Hard Court Championships is one of the longest-running USTA age group championships held at the same site, as well as an ITF Sanctioned Grade 3 Closed National Championship (for American players only). The 35s Hard Courts is also one of the four major USTA surface championships held annually for adults – with the indoor (Brunswick, Maine), grass (Philadelphia, Pa.) and clay events (Plantation, Fla.) held later in the year. Scottsdale Athletic Club also hosts the Fiesta Bowl tournament in early December of each year, which is also an ITF and USTA national level event.